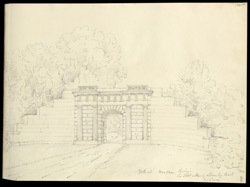 This is the gateway to Hooton Hall, home to the Earls of Stanley since about 1488. The original manor house was pulled down at the beginning of the 18th century. The new Hall was built by William Wyatt in the Italian Palladian style for the fifth Baronet, Sir William Stanley.